Today I feel what only can be described as "askajsdhjasdsjkhd" otherwise known a keyboard smash. I think the weather always makes me a bit down in the dumps, but even more so today. I ran a few errands, went a bit wild in Sainsburys buying naughty things (the weather also makes me eat loads) and went to the gym. Same thing I do everyday! The man behind reception at the gym even commented that I was late today for my usual gym session. I didn't think other people noticed my crazy habits! I bought this dipped hem top in Westfields at the weekend. I've been having real trouble finding things I like at the moment. With summer quickly approaching (although today has been a write off in terms of Summer weather!) I really want to update my wardrobe but despite having money I want to part with on clothes, nothing is really standing out to me! This top ticks a few of my current style boxes: it has a dipped hem, looks great with leggings and has a really unique cloud print. Im not 100% sure about the motif, the heart thing to me screams 915 at New Look or even Tammy Girl but Im going to roll with it regardless. I would prefer it 100% times without that design though though! I love dipped hems, this is really nice! The top is cute, I've not seen it in stores yet! 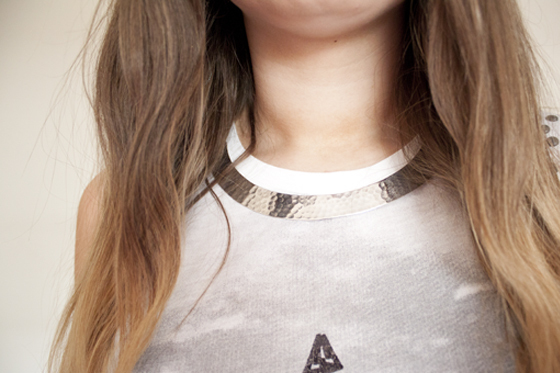 I know what you mean about the print too, although it looks alright on this top! by far one of your best. omgeeee I love this look... I love dipped hem dresses but have always been a bit wary of dip hemmed tops for some reason but it works so well with the leggings! Plus I adore the studded detail on the shoulders, I may have to purchase this top!! I love the jacket, and I have to agree with the comment above your skin looks flawless! The heart looks fine, but I know what you mean, sometimes the highstreet needs to simply be.... simple. 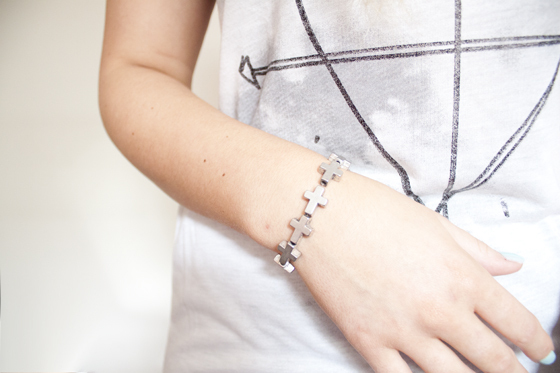 The cross bracelet is a really nice touch! i absolutely love that top, I'm really into basic tops with prints/patterns on a simple but effective way to spruce up an outfit! 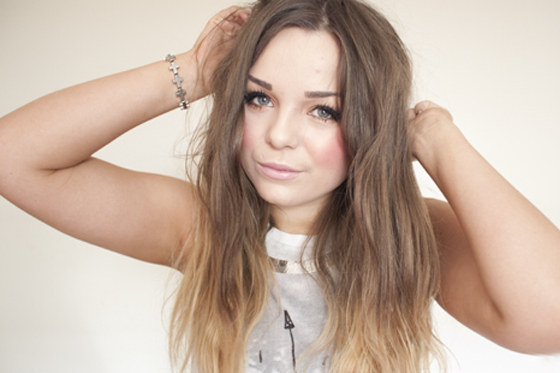 i have a similar one from topshop with a pink galaxy background! i like that you have a triangle coming out of your head. 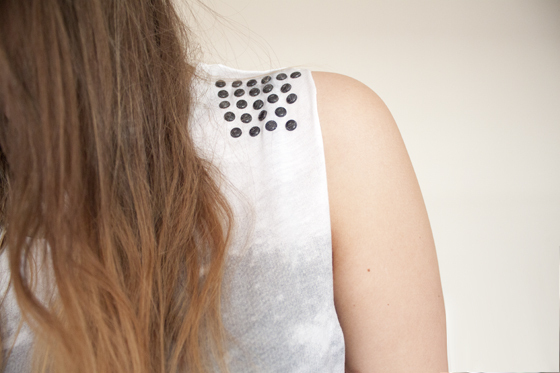 The studded tank is super cute and rocker chic! Many mondays feel like alsknsngsognso days. Hopefully tomorrow will be a better one. Summer weather, where are you?! Love that top! It's almost winter here right now, so I know how you feel about the weather, I get so grumpy! Haha. 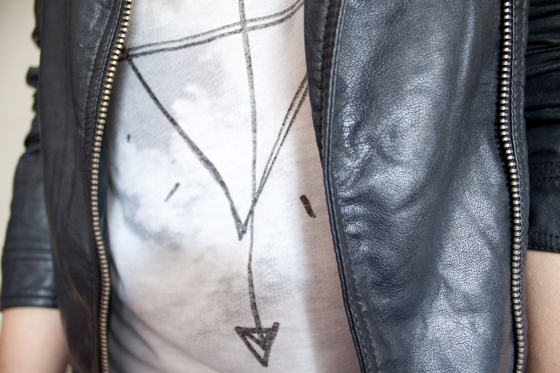 Love your top, the combo with leather jacket looks so cool!! I know what you mean about the heart design, I stay away from hearts in general because they feel too young and girly for me. However the hem line and studs on the shoulder make it much more chic! I'm always a bit unsure about dipped hems, but this looks great, especially with the jacket! I absolutely adore your blush colour, it's perfect. Nice outfit, love that top. Im depressed by the weather as well :( hopefully it brings us a nice summer.. I'm with you on that. I love the cloud print but can leave the doodle part! the weathers been rubbish today. had to fish out a jumper. gurr! I so envy your outfit! Your tops rule!